Shallow geothermal energy systems use the ground relatively close to the surface as a source and sink for thermal energy to heat and cool buildings sustainably. Geothermal energy is available on a 24/7 basis, so it may be conveniently and economically used with a much reduced carbon footprint. Shallow geothermal technology or a Ground Source Heat Pump (GSHP) system uses the ground as a heat source or heat sink. During winter, water is circulated inside the Ground Heat Exchanger. The circulated water will then pick up heat from warmer ground inside of the Ground Heat Exchanger. At shallow depth in Melbourne, the ground temperature stays constant all year with a temperature around 18 deg C. Additional heat will then be added to the system by a Heat Pump to provide heating to the building. During winter, this process is reversed. As part of a research and demonstration project funded by the Victorian State Government, geothermal systems have been installed in buildings at 22 different properties in Melbourne and Victoria. Most of the buildings are new or retrofitted residences. The sites were selected to obtain data for different climates, geologies, types of building and power demands. GHEs at each site have been instrumented to monitor temperature variations in the ground and in the circulating water. All sites are instrumented to determine water flow rates, electrical power consumption to drive the heat pump and heating and cooling power and energy delivered. This shows the typical layout for a house with a GHE comprising 2 boreholes. This shows the typical layout for a house with a GHE comprising 2 boreholes. This project is a collaboration between Department of Infrastructure Engineering and Mechanical Engineering from University of Melbourne, along with CSIRO and IBM research group. They combine various expertise to enable the design and optimisation of the SASGSHP system. This research is further enhanced with the opportunity for a full scale field experiment. Data has been collected for 14 months and is currently being analysed. The key to shallow geothermal technology is energy balanced as thermal energy is extracted and stored from/to the ground. After 1-2 years of operation, the project facilitators found out that the heating usage in the property at Footscray was significantly more than the cooling usage. So they decided to incorporate an Evacuated Tube Hot Water System to the design, to convert the system to “Solar Assisted Ground Source Heat Pump” (SASGHP) system, to improve the COP. 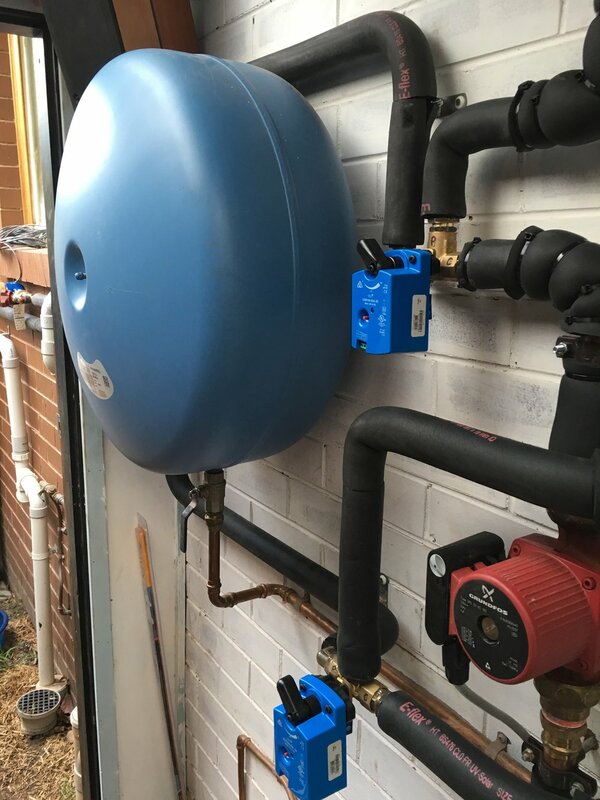 Zenplumb installed an Evacuated Tube Solar Hot Water System, along with a custom Flow Meter, Actuator, By-Pass and Re-Charge Assemblies to enable University’s researchers to optimise the usage of SASGHSP system. In Recharge Mode, excess heat from the solar hot water system is pumped into the ground to boost the ground temperature and ultimately increases the efficiency of the GSHP system.